Rose at quarter-past four, showered and walked the dogs before driving to Berwick where we parked the car in front of Parade as we had to be away over night. We walked to the railway station and caught the 6 a.m. train to London, changing at Newcastle and arriving in London a little before ten to ten. It was a grand journey and London was bright and sunny. We went to look at St. Pancras Station (my Dad worked here before the second world war) and then we wandered to Euston where we caught a tube to London Bridge. We walked across the bridge and along the river bank walk to the Millennium Bridge across which we walked on our way to the Globe Theatre. 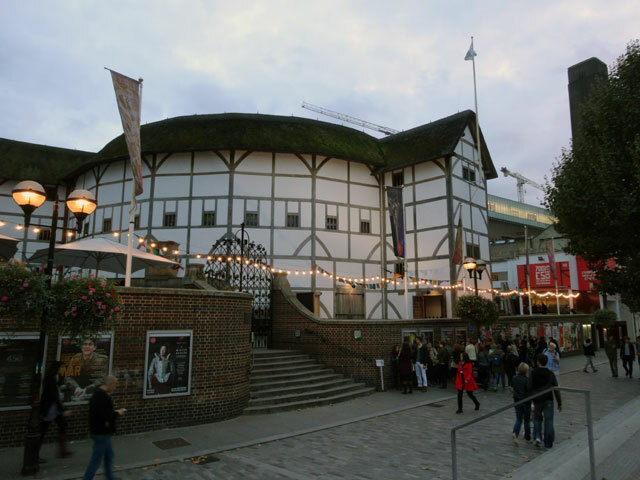 At the theatre we checked when we had to be back for the first performance and then explored Southwark, looking at the cathedral and also at the Golden Hind, Sir Francis Drake’s Elizabethan ship. We had a snack lunch at Eat in the open air by Southwark Bridge and then walked back across the Millennium Bridge to have a look at St. Paul’s Cathedral, one of my father’s favourite places. We were sitting in our seats in the Globe for the performance at 2 p.m. It was one of Shakespeare’s earliest works, The Comedy of Errors, and it was played as a total farce – fast moving, rumbustious, absolutely hilarious and totally wonderful. The theatre was, of course, packed – every seat in the three levels and around seven hundred ‘groundlings’ (mostly youngsters who had got standing positions in the pit for a fiver). We were in the top level equipped with our hired cushion to make the hard bench comfortable. It was a wonderful afternoon. When the play ended there was time for a brief walk along the riverbank before returning to the theatre to attend the Swan restaurant where we dined in style – well it was a once in a lifetime day out – and afterward we returned to the theatre itself for a production of a very different kind. We moved from comedy to tragedy, to the story of Julius Caesar. The actors were superb, whipping up the audience goers into the mob which in turn supported Caesar and then bayed for his blood, which supported the conspirators and then urged their downfall. It was a stupendous production and different from the afternoon also because now we were seeing the theatre under lights. The day was just superb, live theatre at its best in an unbelievable setting and I was sorry when it came to an end and we had to leave our seats (this time in the middle tier) and set off for London Bridge tube station from where we caught a train to Euston. At Euston we boarded our sleeper – a tiny compartment with two bunks which brought us safely back to Scotland. What a happy, happy day we have had.